Rocking Chairs, Mooresville, NC | Gibson Brothers Furniture Inc. Rocking Chairs, Mooresville, NC | Gibson Brothers Furniture Inc.
Our rocking chairs all boast exceptional quality, and we look forward to helping you find the right one for your Mooresville home. Rocking chairs are ideal for living rooms, bedrooms, front porches, nurseries, and many other rooms in your Mooresville, North Carolina home. 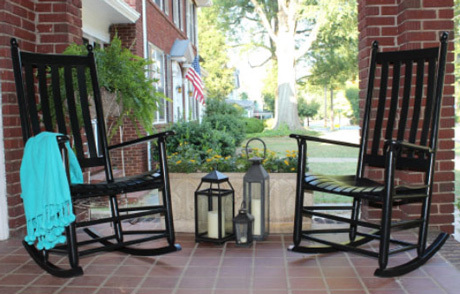 If you are looking for a new rocking chair for your home, but have yet to find the right one, come and see us at Gibson Brothers Furniture Inc. Our rocking chairs are made by Troutman Chair Co., which is located just minutes away in Troutman, North Carolina. Prices start at just $199 and up! Our furniture store has been a staple in the Mooresville area since we opened our doors back in 1953. The minute you walk through our showroom doors, you will notice that our furniture all has one thing in common: exceptional quality. The rocking chairs we carry are no exception, and we are eager to show you the options we have available. When it comes to rocking chairs, we realize your style and tastes are very different from anyone else’s. This is why our furniture professionals will listen carefully to your needs after you come visit our showroom and guide your purchase so you go home with a rocking chair you love. We can also deliver your new rocking chair straight to your home for free if you live within 30 miles of our showroom. Here at Gibson Brothers Furniture Inc., we want to help you outfit your home with quality furniture pieces you love. Visit our showroom today to discover our selection of rocking chairs or give us a call if you have questions about what we have to offer.